Featured in the April 2014 Issue of HGTV Magazine - "Name in the Sky" home portrait. 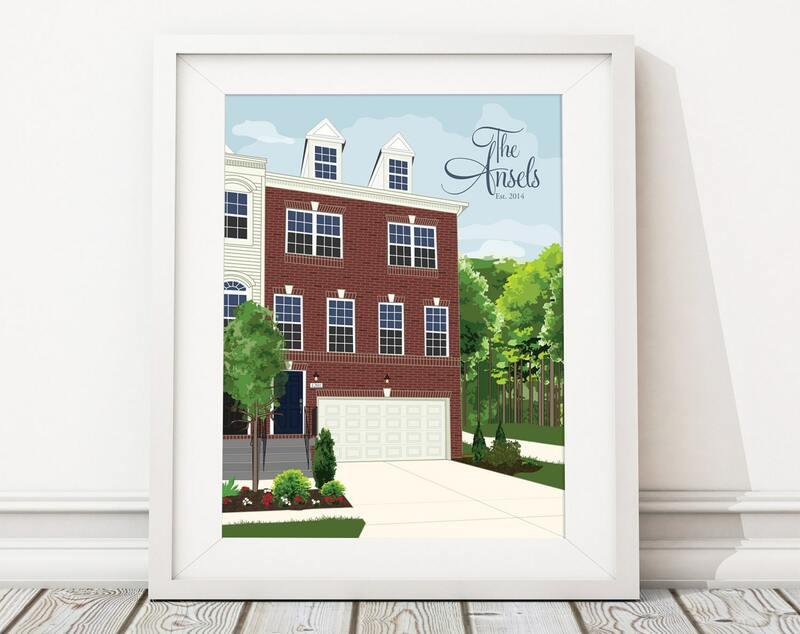 A completely custom illustration of your Home Sweet Home! Celebrate the place where your memories are made with this custom home portrait keepsake! This product can include your family's names in the sky or as a street sign, if desired. It makes a great unique gift for parents, weddings, anniversary, or new homeowners... after all, home is where the heart is! For a drawing that includes silhouettes of pets, please visit https://www.etsy.com/listing/181467066/custom-home-w-pets-portrait-illustration? For examples of single family homes, please visit my shop's Home Portrait section. 1. Choose the final product you'd like (digital PDF to print on your own or a printed poster, if you are located within the US) and check out. The printed posters are $15 (8x10") or $30 (11x14") in addition to the design and those fees include FREE Priority Mail shipping with tracking. 2. Then, email your photo(s) to sameeha [!at] theinkedleaf.com or send via Etsy message. I prefer photos that show the entire house in the angle you'd like the portrait to be drawn. If this is not possible, we can use multiple photos. Photos taken with a mobile phone are usually fine! If you would like me to view your photo prior to purchasing, please feel free to send it and I'll let you know if it will work. ***** What wording you'd like (family name, etc.) at the top of the print or "no wording." ***** Any notes on elements to add/remove from the photo. I draw these completely from scratch (they are not automatically rendered from your photo) so I can modify what is seen (or not seen) in the photo to make the drawing perfect! 3. Once I receive your details, I will contact you as soon as possible with a completion deadline. The current turnaround time is 3 weeks for the first proof, and 1-3 business days for edits. If you are interested in a rush order, or need the drawing by a specific date, please contact me prior to purchasing to inquire about rush fees and make sure I can accommodate your request. 4. On or before your completion deadline, I will email you a proof to review. Once you send back any changes, I will make them and send an updated proof back to you. 5. Once absolutely perfect and you approve the proof, I will send you the printable high resolution PDF and JPEG (if you select the Digital Option) OR I will print and mail your poster to you (Printed Options). The Printed options include free US Priority Mail shipping, which takes 2-3 business days and includes tracking. Another great experience! I have ordered two home portraits from The Inked Leaf and received one as a gift myself. They are all beautiful and Sameeha is great to work with. She is very professional. She communicated the timeline from the start and delivered right on time. Once the first draft is delivered she works through edits very quickly and I had my final piece a few days after that. This is such a unique gift for new home owners, or friends who are moving away and want to remember their old homes. Sameeha has found a forever customer in me! I purchased this to commemorate by daughter buying her first house. The artist, Sameeha, stayed in touch with me every step of the way and she quickly made any changes that I wanted to her drawing. The final product looks even better than the proof she showed me. I highly recommend Sameeha.